India won the ODI series against West Indies 4-1 under the captaincy of Sehwag for the first time. This article gives you complete details about the Indi West Indies series. Read the article full to get the top scorers, top bowlers etc of the India vs West Indies series. 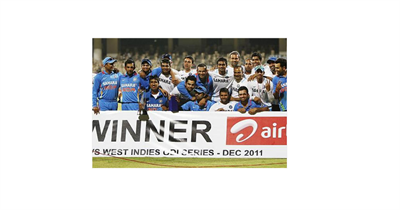 India ends up the year 2011 with a fantastic series win over West Indies with 4-1. India won the final ODI match by 34 runs. Manoj Tiwary made his first century in ODI cricket and awarded man of the match in the final ODI against West Indies. India had taken 267 runs in the fifth and final ODI and West Indies batting was not up to the mark except KA Pollard who made stunning century of 119 runs from 110 balls with 10 sixes in it. Andre Russell well supported Pollard with 53 runs but ends up the innings with 233. India vs West Indies series 2011 also witnessed some huge records where Virender Sehwag scored a Record ODI individual score of 219 runs. Sehwag became the second cricketer to score a double century after Sachin Tendulkar and holds the record of highest Individual score in ODI cricket history. India scored 418 runs in that match which was the highest Indian team total in cricket history. Rahul Sharma made his ODI debut in this series and had taken 3 wickets in the first match itself. R0hit Sharma became the leading run scorer in the tournament and RA Jadeja became the leading wicket taker in the series. More details about the leading run scorers, leading wicket takers and series details of India vs West Indies series are given below. We have seen some great batting and bowling performances from both India and West Indies in the series. While taking the batting performance, Rohit Sharma became the highest run scorer in the series with 305 runs. He maintains the consistency in the series with the scores of 72, 90, 95, 27 and 21 runs throughout the series of 5 ODIs. Sehwag is the second highest run scorer in the series with 265 runs. Sehwag's record score of 219 runs in the fourth ODI against West Indies made him to the second leading run scorer in the series. Virat Kohli is the third highest runs scorer in the series with 243 runs followed by Pollard from West Indies with 199 runs and Ramdin with 164 runs. While taking the Bowling performance, RA Jadeja became the highest wicket taker in the series with 9 wickets and series economy of 4.53 and KAJ Roach is the second highest wicket taker with 9 wickets with an economy of 5.58 followed by Umesh Yadav with 6 wickets, Ravi Rampaul with 6 wickets and Vinay Kumar with 5 wickets. More details about the run scorers and wicket takers are given below.